We offer a complete line of igniter styles to fit most makes and models of kerosene heaters. Match the correct style for your kerosene heater easily using the chart and descriptions below. Igniters are engineered and tested to provide extended trouble free use to ensure optimum ignition and performance. Replacing the kerosene heater igniter in your heater each season is recommended maintenance. Behold the position of the pins at the base of the igniter. Igniter A has pins at an opposing right angle to the igniter coil. 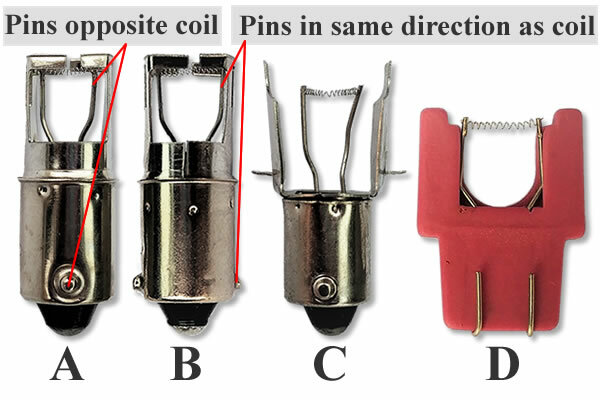 Igniter B's pins are in the same direction of the coil. If you feel uncertain, Igniter A is considered the universal igniter and the most prolific in use. How long do igniters last? The life of a kerosene heater igniter depends upon the electrical system of your kerosene heater. With clean contact points, igniter in alignment, and a wick in good condition an igniter can last for years. If contact points are corroded, igniter linkage misaligned, and a shabby wick, igniters can be ruined with one or two uses. The electrical system of the kerosene heater should be maintained to ensure proper functioning. Replace your igniter, wick and batteries before each heating season. Avoid unnecessary dirt and damage caused by match lighting. See owners manual for complete installation instructions. If you are not satisfied with any Kerosene-Wicks.Com product you may return it within 30 days for replacement or refund.